1) Last night all 3 of my kids were in the bathtub together for the first time. I was grinning ear-to-ear & then EJ insisted I "take a picture" of them...okay, i think I will! 2) We spent a lot of time killing time at the bookstore on Wednesday. Jack may have read a book or two to me (as if we were at the library) and we did a fair amount of browsing while Daddy got some work done. I found the workbook section and they had a kind Jack doesn't have that looked really good. We checked it out and I asked him if he would do a page or two every day after school if I got it for him. He answered, "I'd do anything for you Mommy!" What a brown nose!! ...but he did get the workbook! 4) Olivia can now wave and clap...we aren't sure how she picked this up, she just started doing it one day. So the other night we were all hanging out and Matt says to EJ, "Look, Mommy taught Olivia how to wave!" I questioned him on that because I never once showed her how to do either thing. Matt said that I taught Livie "the same way you train a dolphin. They do something naturally and you reward them with praise." Who knew? 5) During our recent day trip for jack's passport, my Mom watched EJ and Olivia for the day, but EJ had her second day of school, so my friend Deb drove EJ with her daughter (thanks again Mom & Deb!). We had talked about the day the night before and EJ heard me use Deb's name and said it. We have a semi-strict policy of our kids not calling grown-ups by their first names unless they are preceded by Miss or Auntie (or Mr or Uncle as the case may be), so I made a big deal out of saying to EJ that even though I say Deb, she should call her..."Abigail's Mommy"...she knew the deal. So I get a sweet email from Deb saying that everything went well and that EJ was very polite. She even said "Thank You Deb!" when she buckled her into her car seat! That little stinker! 6) Lately Olivia can get everywhere and anywhere (usually somewhere naughty) that she wants to. I thought I was safe because she isn't even trying to crawl...last night Matt said he thought she might never crawl because she doesn't need to for as mobile as she is. I often hum the Mission Impossible theme as I watch her fly around. This is the SLOWEST I've ever seen her move about but she definitely knows the camera and I think that was the issue. I also can't believe how long it took her to get that piece of foam into her mouth (that is a constant battle). Sorry about the shaky (and upside-down for awhile there) camerawork! Last thing...don't forget to enter this awesome etsy giveaway! One more day...comment to enter! 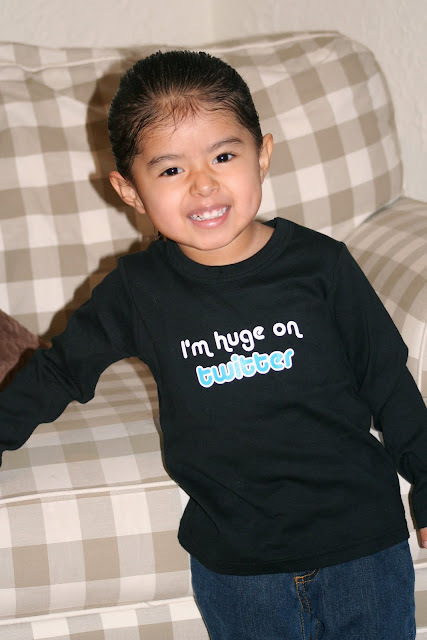 EJ's shirt is just adorable -- and the sentiment is true!!! Love it. (And where do I get one in my size!? LOL!) Love the kid stories so much! Funny one of my own -- we were taking our Christmas cards down, and Meg saw your card and said, "Oh . . . EJ and Olivia are soooooo cute." (Sorry Jack, you apparently have boy germs!) Sounds like that get together should happen!! Ya, they are all pretty cute, you are very blessed my friend! p.s. i love ej's shirt! ADORABLE!! all of them and all the stories! awww. watching that makes me really miss that age. norah never really learned to crawl, but she could roll like mad and i'd often find her half under the couch, stuck. quite funny.